New York Cargo PVT. LTD, Freight Forwarding Agent, offer a single- source solution to manage your transportation and freight giving you the capacity to extend your business horizon beyond the Nepalese Skyline. Our expert and dedicated staffs can design the most effective solution for your company to expand your business using a vast network of air, ocean, rail or road transportation modes. 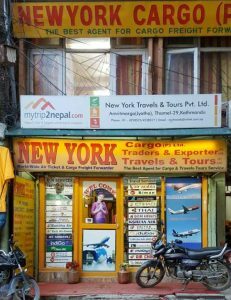 Being one of the most leading and successful service provider companies of Nepal, New York Cargo PVT. LTD was established in 2005 under the company’s act of His Majesty’s Government, with a view to service the increasing demand for freight forwarding activities & for custom clearing agent too. It was successfully founded by Mr. Jeevan Pandey. From its foundation it has been successfully and smoothly providing its services to both national and international customers by maintaining customer loyalty. At New York, our business objective is to provide world class transportation services of all modes for our customers while, at the same time, providing a professional and friendly work atmosphere for our customers and employees. To provide quality services seeking customer’s satisfaction and happiness. It knows that their satisfaction counts the most for their existence. For bringing automation in work, the company is equipped with latest technology and has invested heavily in infrastructure. Having the good connection with other companies, New York Cargo is responsible for providing home delivery services to any parts of the world within 3 to 7 days by the help of experienced and dedicated personnel. Besides this the company has an International Network with similar companies for close co-operation and communication. To maintain our high level of services, we hire only the most qualified candidates who have diverse skill and can grow, take new challenges and expand their skill easily at any related field. Here, each employee contributes to our overall success through personal responsibility, commitment and teamwork. In return, we provide them with an energetic, rewarding and challenging work environment along with a competitive remuneration and benefit package. A group of well competent personnel have managed this company. Their hard work, commitment and dedication have made this company one of the leading company in travel and cargo in Nepal. New York Traders & Exporters (P) Ltd.
New York Travel & Tours (P) Ltd.